The Venerable Master and all Good and Wise Advisors. Since we are now on Entering the Dharma Realm chapter, I will attempt to discuss a little about what this section of the Sutra means to me. If I had to sum up what this chapter illustrates, I could perhaps say that by practicing utmost filiality in body, speech, and mind, one can certify to the different supreme levels of world-transcending filiality. Some of you might be puzzled and may wonder why this chapter is being connected to filiality. According to the dictionary, the definition of the word “filial” is: Conduct befitting a son or daughter. 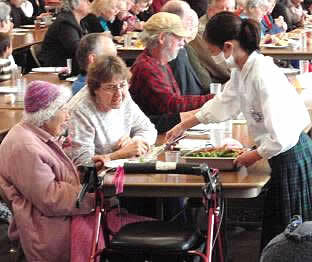 The synonyms for the word “filial” are: devoted, dutiful, and respectful. “The superior person turns his attention to the roots. When the roots are established, the Way comes forth. Filiality begins at home. To be filial to one’s parents is to nourish one’s own roots of being a human being. This is a fundamental principle. This is our most important human duty. If one treats one’s parents badly, one is neglecting one’s roots and forgetting one’s origin. And so in the elementary school here, students are taught to be filial to their parents and respectful to their elders and teachers. It is said that heaven and earth regard filiality as important. When there are filial sons and daughters, heaven and earth are delighted. In Buddhism, our parents are like living Buddhas at home. The Venerable Master told us that when a person is filial to his or her parents, the Buddhas are happy. The Master conveyed this principle by bowing to his parents every morning and evening. If we study the Master’s life, we can see that he employed different methods of inspiring people to practice filiality. Before the Master renounced the householder’s life, he was already well known for his filial practices. 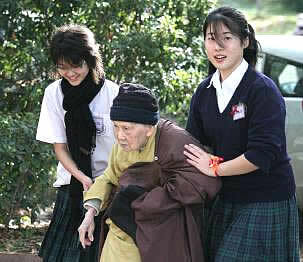 When the Master’s mother was ill, he stayed home to take care of her. When his mother passed away, the Master stayed by her grave and observed filial piety for three years. The Master has mentioned before that he does not dare make mistakes because if he did, he would be being unfilial. The Buddha also taught by embodying his own teachings. When the Buddha’s father was sick, the Buddha visited him. When the Buddha’s father passed away, the World Honored One carried his father’s coffin. 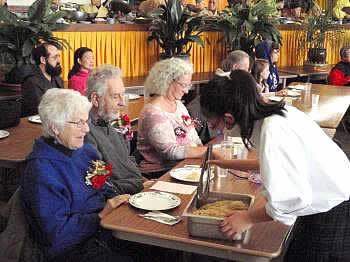 The Master taught the importance of being filial on a larger scale when he initiated “Honoring Elders Day.” Because by doing that he had introduced the practice of extensive filial piety, whereby people and children are given a chance to treat and serve all elders as their own elders or parents. The Youth Good Wealth listens very reverently to the teachings imparted by the many Good Advisors he meets along his spiritual journey and constantly recollects and puts what he has learnt into practice. He displays utmost respect to all the Good Advisors he encounters. He is so sincere in his filial devotion towards his masters and their Dharma, that he never fails to genuinely practice what they teach him and thus is able to certify to the different levels of samadhis, wisdom, liberations, and stages of a Bodhisattva. 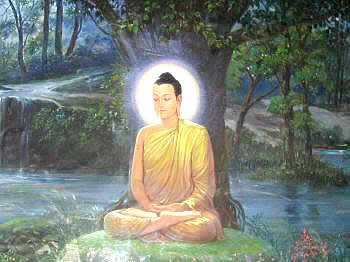 The Youth Good Wealth is a supremely filial disciple of the Buddha because he has certified to the fruits of the Way. How did the Youth Good Wealth arrive at such a lofty position? During his long spiritual journeying, there was never an instant where he was distracted from his spiritual goal. He never wavered in his supreme resolve for the Way. At all times, he was determined to continue practicing the Bodhisattva Path of utmost filiality until he arrived at his ultimate destination. From this simple discussion on filiality, we can see that the basic foundation for being humans is to be filial to one’s parents. Ideally speaking, virtues should first be cultivated and developed at home. Because when we know how to be filial to our parents, then being a filial disciple of the Buddha becomes a natural progression. When we can perfect this most difficult art of being a Buddhist disciple of great filiality, we would then be just like the Youth Good Wealth, Earth Store Bodhisattva, and all the Great Bodhisattvas. In the Sutra on Visualizing the Infinite Light Buddha, the Buddha explains the three kinds of merit one needs to perform in order to be born in Amitabha Buddha’s Western Pureland of Ultimate Bliss. The first is to care for one’s parents, attend to one’s teachers and elders, to refrain from killing and to practice the ten good deeds. 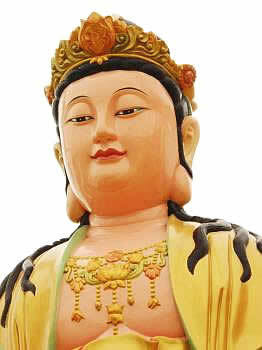 Universal Worthy Bodhisattva is one of the Four Great Bodhisattvas and he represents perfection. How did he attain such an illustrious position? According to the Avatamsaka Sutra, in every thought and action, Universal Worthy Bodhisattva is always in perfect accord with the Buddha’s teachings. 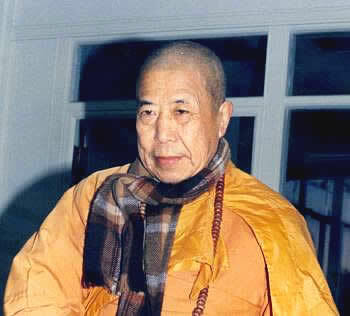 He has cultivated for an immeasurable period of time without ever going against the Buddha’s teachings. 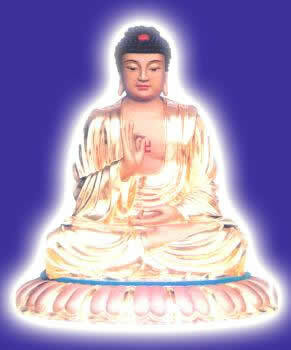 Hence, he is a most filial disciple of the Buddha. 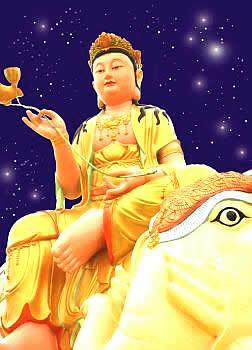 He is also the host of the Avatamsaka Sutra who requests the Dharma on behalf of living beings. 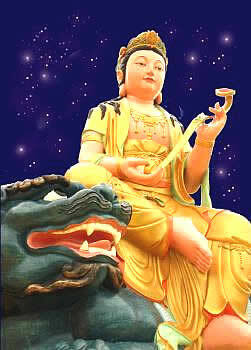 Universal Worthy Bodhisattva practices unsurpassed filiality. Because in the Avatamsaka Sutra, he vows to take care of all the different kinds of living beings and to treat them all in the same way he treats his own parents, teachers, elders, Arhats, and the Buddhas. So we could say that knowing how to practice filiality to perfection is a prerequisite to the realization of Buddhahood. 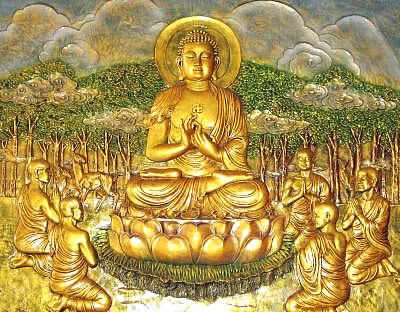 Before the Buddha entered Nirvana, he told his disciples to take the precepts as their master. When we are able to always observe the precepts, we are being genuine filial disciples of the Buddha. In that sense, one could surmise that the Buddha was also instructing his disciples to take supreme filiality as their master. We could say that supreme filiality is the highest precepts. Supreme filiality refers to great filiality which is beyond secular love and the defiling emotions. 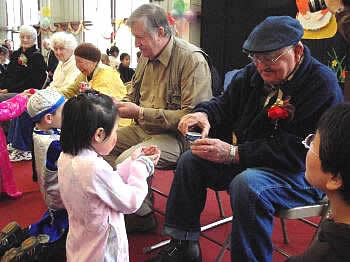 It is when a filial person is able to cultivate to accomplishment and rescue his past parents and ancestors. From great filiality, a sage cultivates until he realizes ultimate filiality and becomes a Buddha. When the Buddha ascended to the Trayastrimsha heaven to speak Dharma for his mother, that is known as ultimate filiality. Thus the observance and upholding of the Bodhisattva precepts can be described as the practice of great altruistic filiality. I must stress here that what the Master said to me then had a tremendous wholesome impact because of his inconceivable stature and lofty pure conduct. "No teaching is apart from Filiality. Apart from filiality, there is no teaching. When the limitless lessons under the sky are summarized, it is just this one lesson. This lesson encompasses limitless learning. Study this lesson to perfection and other lessons will also be completed."